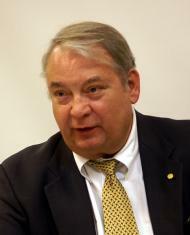 Ferid Murad is an Albanian-American physician and pharmacologist, who won a Nobel Prize. A gas balloon is any balloon that stays aloft because it is filled with a gas less dense than air or lighter than air (such as helium or hydrogen). A gas balloon may also be called a Charlière for its inventor, the Frenchman Jacques Charles. Today, familiar gas balloons include large blimps and small rubber party balloons. Blimps have displaced zeppelins (which are not balloons) as the dominant form of airship. Kittinger retired from the Air Force as a Colonel in 1978 and initially went to work for Martin Marietta Corporation in Orlando, Florida. He later became Vice President of Flight Operations for Rosie O'Grady's Flying Circus, part of the Rosie O'Grady's/Church Street Station entertainment complex in Orlando, prior to the parent company's dissolution. Still interested in ballooning, he set a gas balloon world distance record for the AA-06 size class (since broken) of 3,221.23 km in 1983. 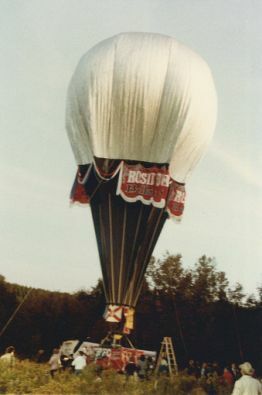 He then completed the first solo Atlantic crossing in the 106,000 cubic foot (3,000 m³) Balloon of Peace from September 14 to September 18, 1984. As an official FAI world aerospace record, it is the longest gas balloon distance flight in AA-10 size category (5,703.03 km).